Written with the combined knowledge of t722, Kokiase, Sammyrabbit, Cyn, Lotok, and Kaitou-al. Why get screening permissions to show anime publicly? So some background. All the following pointers are specific to Canada, but I think that this can be applied to any kind of similar setting where there is a club. The other guide I have seen online is on the RightStuf forum that no longer exists, and this was extremely useful in talking to anime licensing companies in North America for screening permissions. We regularly have success with companies like Funimation and Crunchyroll. Why? Because you can. They’re not that hard, plus, with so many ways to show anime publicly and legally now, you should get them to show anime at your club events. There may be some errors, so if you see anything that needs to be changed, let me know. Please note that I have since graduated, so if you want someone to talk to, contact the current External Relations Officer for CTRL-A, they might have more up-to-date information. Alright, onto the actual guide. Some companies charge money for screenings, some don’t. It’s up to you and the budget of your club what you want to do when someone asks for fees. The club I was a part of don’t screen titles that request money (as a student club), which works most of the time. We have a “Criterion Pictures” movie license through our student union, which allows for public screenings on campus out of their catalogue of films. Included in that catalogue is some anime (Akira, Princess Mononoke, Pokemon movies). We usually verify with the person in charge of the clubs at our university that we plan on screening a particular title, and the response is pretty fast (anywhere from a few days to a week or two). Not every university has a comparable one, but it would be worth it to poke around to see if your school/library has a license like this, and if not, ask for one. Step one to getting screening permissions is finding the right person to ask. The most reliable method is to look the series up on Anime News Network, scroll down to the “English Companies” section, and check the “Internet Streaming” and “Licensed By” fields. The “licensed by” info is correct 95% of the time, and the internet streaming info is correct maybe 50% of the time. Rightstuf usually has correct licensing info if they sell the series. Wikipedia and Google can provide more info if needed. 90% of series are licensed by one of Funimation, Bandai, Section23 Films/Sentai Filmworks, and Crunchyroll. How do you get the anime to show? There are two main ways that the moment. One is streaming through companies like Crunchyroll, HiDive, Viki, Anime Network, Funimation’s Youtube, Funimation – the following are also possible, but not applicable in Canada – Viz/ Neon Alley, hulu. The second method is using legal versions of the DVD/BDs of the anime that you wish to screen. Some companies send out screeners, but we haven’t received anything in a while, and those that do often charge a small fee. We have also received free discs before. Discs from companies like Section23/Sentai Filmworks, GKids, Funimation, Aniplex and others are places we usually get permissions from. Streaming and discs will be covered in the next section. This program appears to have ended, following up. (February 2019, see this Crunchyroll forum thread and Twitter.) Crunchyroll supports anime clubs by giving them an Anime Membership account to stream anime. Sign up for a club account, fill out the form on the Outreach page, and you should hear back soon. Campus wifi is particularly bad, so we’ve had to adjust some things (720p is okay depending on the playback hardware, tried using their PS3 app, using a classroom with an ethernet jack). The account comes with certain stipulations, like a minimum or 2 shows/quarter of a year. You don’t need to request screening permissions for every show, but you might have to fill out a form after every showing. Funimation allows for streaming from their website (paid subscription for HD), and their Youtube channel (free, goes up to 480P). Funimation also publishes DVD/BD collections of their anime, and that is mainly how we show the anime they have licensed. The end of Operation Anime made things harder and there was a period where they didn’t take requests, but if you do it right, you might get permissions. We used their “Screening Consent Form” that they send you when you request the form before. They’re usually a bit slow to reply, so follow up if they don’t reply within the week, or else they’ll ignore you. They may try to forward you to Swank Motion Pictures who charge you ~$250/screening: tell them that a) you’re in Canada, b) you’re a club, and they don’t fit your budget. They’ve recently created a list of shows that you can screen on the Funimation Consent Form, so anything on there, you can probably get the permissions for, all in one go. Talked to them, you don’t have to ask their permission every time to screen titles. We have a club account, but have yet to use it. ANN’s anime streaming has ended as of August 20, 2017, and their shows can be found with HiDive, or Sentai Filmworks. They’re apparently working on a new system for their contact page. It can take 2-3 months to process the permissions through email (but they have replied before that time to give permissions), and they need the exact date/times that the anime will be shown. The screening permissions request form can be found on their Contact page (ignore the fax and snail mail addresses). Max 4 episodes/event, faxing isn’t any faster. This is under Viz Media/hulu. Looks like they’re not coming to Canada after all. Infinite sadface. You can try contacting them, but the experience so far has been that it cannot be used for club events. Pony Canyon is coming. No news on this yet. Haven’t used Daisuki yet. Daisuki ended service as of October 2017. Official Gundam portal, they have a Youtube channel. Have yet to use it/ask for permissions. You might have to dig a little to actually figure out who has the rights, usually the title has been re-licensed by another company, and you will have to request permissions from the new company. Send an email to info@sentai-filmworks.com and “Mike Bailiff” mike@section23films.com. He usually responds within 24 hours. You may need to print a form, sign it, and snail mail it back to them. Note: they usually say “no” to screening their movies, but try anyway. When you contact them, it forwards to ACF Films in Canada. They usually ask for a screening fee of $200 (but you might as well try, but we’ve never been successful at negotiating the price). They have a screening permissions form online. They might even mail you screener discs sometimes. For content that they have licensed (not just which they show), email Chance Huskeychance@gkids.com. If you explain that you’re a small club with no budget, you may get lucky. They’re really good with responses. 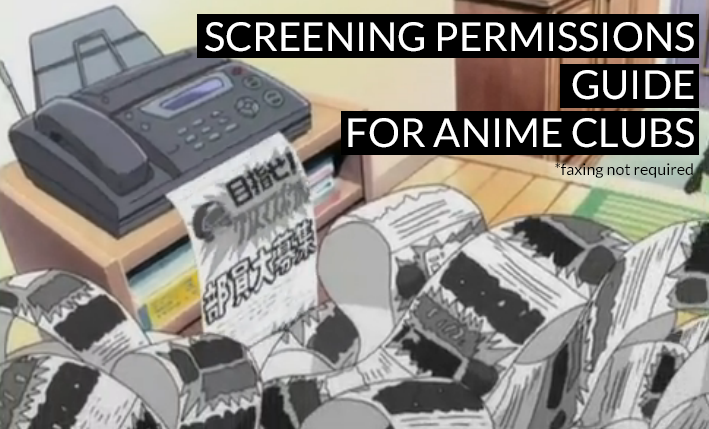 As far as now, anime shows are fine, but they don’t give screening permissions for anime films. You can always try anyway. Last time, I talked to Joanna.metoki@aniplexusa.com, but the Rightstuf forum lists emmanuel.rivera@aniplexusa.com. I believe that universities and libraries usually have a public screening license agreement, the main one we have dealt with in Criterion. (University of Waterloo only) UWaterloo has a licensing agreement with Criterion Pictures. To get approval to watch something through this license, send an email to Dave McDougall djmcdoug@feds.uwaterloo.ca (director of clubs and services at UW). Include a link to the content on the website. If the content is licensed by a company covered by Criterion Pictures, you may still be able to pull it off. Send Dave an email with evidence that it should be covered by the license. He may direct you to someone else to get it added to the site, or just approve it. No luck here in recent years. See this Answerman column for further details. No response as of 20th anniversary of CTRL-A, according to t722. They have a social media account on Twitter and a Youtube channel. Contact animeclubs@rightstuf.com: “I am contacting you on behalf of our club regarding permission to screen a number of anime licensed by Geneon. We are interested in obtaining permissions to screen the following anime: [etc]” They will tell you if the anime has a new distributor (often Funimation). If it has a new distributor, contact them. Otherwise, we consider it fair game based on Jeff Bowring’s advice from a while back. Look for a email on their website, contact another club that has screened the title recently, ask around. Now onto the hard part! How do you get screening permissions? For the most part, all you need is an email address, and at times, you might need to sign things and send them back, so maybe a scanner and/or some kind of PDF editing software. My name is (your name), and I am contacting you on behalf of (your club or group’s name) at the (your university, if applicable) in (city, province, country). I am contacting you regarding permission to screen an anime for which I believe you hold the rights. The anime would be shown at events at the (location), for which we do not charge admission. The events will occur on the following dates: (Month, day), and (Month, day). The event is also open to the public. Thank you for your time, and hope to hear from you soon. Some companies have screening permissions forms online, like Funimation, so you can speed up the process if you fill it out and send it with your initial request. If you do use a PDF form, mention that the PDF is attached somewhere in the email, in case they miss it. Sometimes they ask how many people are expected to show up. What happens if they don’t reply in a week/month? Follow up (politely). Re-attach the signed form if needed, and mention that you sent something earlier. Be persistent, but not irritating. It can take anywhere from days to weeks to get responses, so do it early. Some of the companies have social media accounts, if all else fails, ask them there if they do screening permissions/take email to try to get their attention. If they have instructions on what to screen, like only certain episodes, follow them. We’ve had some weird ones, like they would only charge us for the screening if it was on DVD, but not if the blu-ray was screened. It depends. I usually use a colour-coded Google spreadsheet to share with the rest of the exec, so whoever is making the schedule can see what permissions have come in, and who has what discs. It helps keep track of the series, licensor and the current request and approval status. Quite an informative article, my group/club the Louisville Anime Community is quite similar in scope to CTRL-A, but we’re only a year old. Hopefully we can follow in your footsteps and avoid some of the pitfalls. Thanks! This filled in some of the gaps in my contact list without having to chase everything down on my own. Best damn article regarding this, way more informative than the rightstuf forum post referenced. 10/10 will definitely make my life easier. Great information here, saves me a lot of work trying to find contact info for every single company. Anybody know about Amazon and their new Anime Strike service? It looks like most of the titles are actually from Sentai Filmworks. I doubt Amazon would understand if I tried asking them. I’m mainly posting this just in case anybody comes across this in the future, but Amazon is basically a no-go. I got a response from them basically saying no public screenings ever. It’s unfortunate because some newer shows are exclusively on Amazon now. Also it looks like the ctrl-a.org website broke recently. Does anybody that currently manages the site need help fixing it up? I messaged one of the club members, and the site is back up now. Thank you for that, as well as the update.